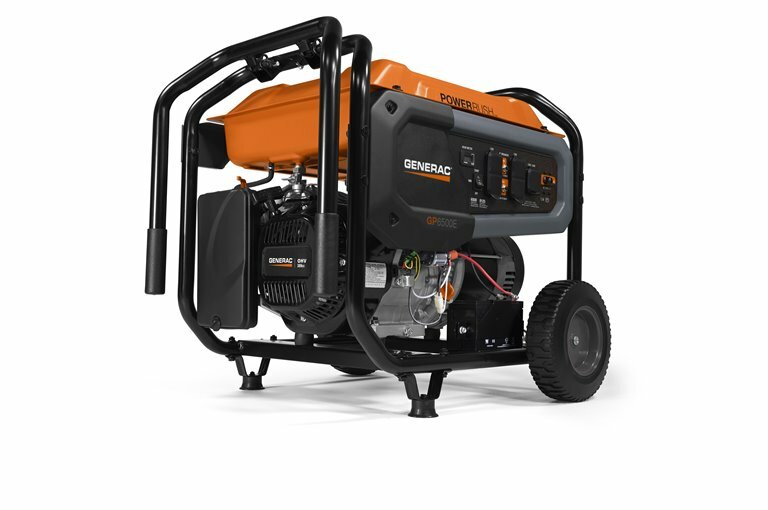 Generac’s GP6500E portable generator offers PowerRush™ Advanced Technology, which delivers more than a 40% increased starting capacity*allowing you to do more with less. Generac’s OHV engine and large-capacity steel fuel tank ensures extended engine life and run times, while the steel tube cradle provides added strength. The low-oil feature protects the generator from damage. The GP6500 can be easily transported across rough or difficult terrain with the heavy-duty wheels and easy fold-down handle. Even maintenance is a breeze, with the hour meter keeping track of necessary upkeep at regular intervals.